Immigration, Criminal, Corporate, and Tribal Law Clinics and public and private field placements. 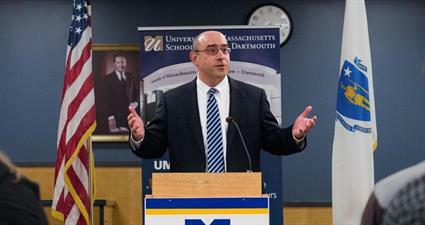 Dr. Eric Mitnick serves as interim dean and professor of law at UMass Law. After completing his undergraduate studies at Cornell University, Dean Mitnick earned his JD at the University of Michigan Law School before completing both master's and doctoral degrees at Princeton. He has been a law professor at the Thomas Jefferson School of Law, the University of Wisconsin Law School, and Princeton University. His research and scholarship focuses on rights, liberalism, sociolegal and multicultural theory, and procedural due process. He is published in multiple peer-reviewed journals, and his work has been cited by the Supreme Courts of New Hampshire and Vermont. We reached out to Dean Mitnick about his views on legal education and the current and future landscape for law students and practicing lawyers. I think without question the biggest challenge facing new law students today is excessive student debt. Prospective law students need to spend substantially more time considering affordability in choosing which law school to attend. Accumulating too much debt can dramatically limit life and career options, which may frustrate the goals that led students to law school in the first place. Time management, and a healthy prioritization of goals, is critical. There just is never enough time to do everything you want to do in this position. But if you maintain a system that ensures the highest priority goals receive the attention they deserve, the institution will move forward in the best possible way. I would look for continued expansion in areas related to communications, technology, health, energy, and international law. I see at least four major differences, each of which I think is positive. First, faculty members are far more accessible. When I was in law school, I spoke with a professor outside of class just once, and that was once more than most of my classmates. Second, there is much greater emphasis on experiential learning, and not just in clinics but throughout the curriculum. Third, there are many more opportunities for formative assessment (e.g., quizzes, midterms), which further student learning. Finally, technology has facilitated changes in the classroom experience, altering presentation methods (e.g., PowerPoint), enabling instant polling (clickers), and connecting people across large distances (distance education). Technology has dramatically increased the amount of evidence available, including things like DNA information, the ubiquity of video surveillance, cell phone and GPS data, and electronic roadway tolling. It sure seems like some of the biggest legal challenges the Supreme Court will be faced with in the near term will concern separation of powers and executive power, but also related issues involving immigration, religion, and money and speech in the political process. I love teaching and being around ideas, so I am very happy in an academic setting. I will admit to occasionally wishing I had more of a ground-level view of the practice of law so that my teaching does not become too far divorced from practice. If you could invite any three legal or governmental identities (living or dead, real or fictitious) to a meal who would it be? How great would it be to have Hobbes, Locke, and Rousseau around a single table discussing social contract theory? “… And Justice for All” Al Pacino gave a terrific performance as a lawyer struggling to find justice within a faulty system, and Barry Levinson’s script is full of great characters and dialogue.